Driving home from baseball practice yesterday, I passed a sign in front of a in church in Odenton that caught my eye and made me think. Usually the sign has some interesting statement or Bible verse on it which I believe relates to the weekly activities or the message for the Sunday services. I wish I had stopped to take a picture of yesterday's sign. I typically look at the sign, note what it is trying to tell me and drive on thinking no more about the message. Yesterday, however, it was very different. 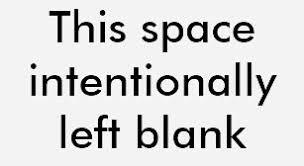 The sign said: "This space intentionally left blank." That got me thinking. I have seen that phrase, or a similar one, "This page intentionally left blank" in a lot of places. Here's the rub--if it says that it was intentionally left blank, and the words are written there, is it really blank? If it were really blank, then the page or sign would have not words on it. It would be, well, blank. So the sign if the sign in front of the church was trying to be blank, but wasn't really blank, then what was the sign really saying? Perhaps it was trying to tell me that nothing is really ever blank as there is always something there, we need only to discover the substance. Four? Four in a row?